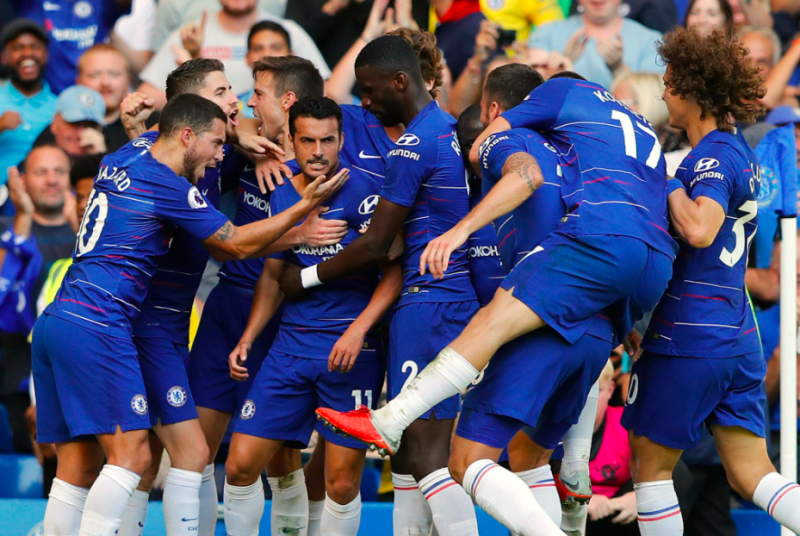 Chelsea faced Bournemouth at Stamford Bridge today, seeking their fourth consecutive win in the new Premier League campaign. A difficult first-half was turned around by substitute duo Olivier Giroud and Pedro, who worked a late, but well-deserved opener for the Blues. Eden Hazard struck one in himself before the final whistle, and the job was done for Chelsea. Kepa Arrizabalaga – 6 – Bournemouth really failed to test Kepa today, missing some great chances in-front of the Spanish keeper. Another clean-sheet to his name, though! Cesar Azpilicueta – 7 – Often had the time and space to lob in threatening crosses, but the majority of them lacked quality. Good game defensively. David Luiz – 6 – The Brazilian has looked a little bit shaky in recent games, and couldn’t avoid making mistakes either today. Sloppy passing at the back almost resulted in a Bournemouth goal. Antonio Rudiger – 8 – Great game from the German international. He’s really cementing his place in the Chelsea back-four! Marcos Alonso – 7 – The Spaniard was well involved in Chelsea’s attacking game again, but he seemed more focused on defending than before this season; perhaps due to Sarri’s comments on his defensive abilities after the Blues’ 2-1 win over Newcastle last week. Went close to a goal, striking the ball to woodwork at the end of the first half. Another assist for Hazard’s goal, too! Jorginho – 8 – Truly bossing the middle of the park again. Great movement in between the lines and creating space for Kante, Kovacic beside him. Truly a key part of Sarri’s system. N’Golo Kante – 8 – He was everywhere again, either racing towards the Bournemouth defensive line or tracking back at their attackers. Brilliant display overall, just needs to work on his final pass in the attacking end. Mateo Kovacic – 7 – Another solid performance from the Croatian international in the three-man midfield. Drove a lot more towards the opposition defensive line than against Newcastle last weekend, and it caused constant havoc to the Bournemouth back-line. Took like five shots but had all of them blocked, unlucky. Subbed off ten minutes before the end of the game. Willian – 6 – Good dribbling, good passing, good work-rate, but something was just lacking from him today. Subbed off after 68 minutes of play. Alvaro Morata – 6 – Scored a lovely goal but it was just ruled offside. Had a good first half but should trust his first-time shots more. Became frustrated and was deservedly replaced by Giroud after an hour of play. Perhaps the international break will do him good? Eden Hazard – 9 – Once again the Blues’ main attacking threat on the left flank. He’s becoming more and more consistent with his performances too, as he’s now scored his second goal in two starts! He truly loves playing against Bournemouth as well, knocking in his sixth goal against the Cherries in eight games. Olivier Giroud – 6 – Got straight into action just minutes after coming on, and really gave a lift to the Blues attack. Great assist on the opening goal, unlcuky not to score himself. Pedro – 9 – Instant impact from the Spaniard! He was surprisingly benched today, but by scoring the winning goal here he’s surely won himself his place back in the starting line-up. Ruben Loftus-Cheek – 6 – Good ten minutes from the Englishman, who really needs more minutes to bring out the best of his game.